FLOORED - Holly Bourne, Sara Barnard, Tanya Byrne, Non Pratt, Melinda Salisbury, Lisa Williamson, and Eleanor Wood. Published: July 2018 - Macmillan's Children's Books. Genres: Young adult / contemporary / drama. Triggers/Content Advisory: Bad language / sexual innuendoes / some explicit sexual content. I love the concept. But the book is strange, and in a way that's neither bad nor good. So I don't know which author wrote which chapter or which character, but I admit the writing comes across very similar in each character's voice/chapter. I think it easily could've been from one author. In terms of quality, the style also isn't bad - just pretty average. Basically, the writing isn't unique. It doesn't leave much of an impression. BUT. The story does improve as you keep reading. The ending is also sublime; it couldn't be more perfect. So I guess that does kind of redeem what's come before. "We've all changed loads, you know. Everything's changed loads. Maybe I do have a hero complex. Maybe that's my job, in our crew: the hero. And Velvet's our conscience. Sash is our heart. Joe is our rock. You're our bruiser. And Hugo is...Hugo is Hugo." There are too many points of view. It also doesn't help that the chapters are short, hardly giving you time to get in a character's head. The characters' voices aren't distinct, either (although maybe with the exception of Hugo) and no one's personality is clear and vivid from their first POV chapter, which is obviously the critical time. By the end, I did have a clearer idea of who everyone was (I even liked one character: Sasha) and I definitely warmed up to them, but they still aren't memorable or strong. Their personalities don't leap off the page. 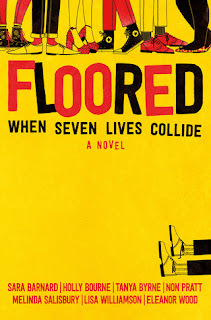 Floored is somewhere between average and great. It's not unpleasant to read, but it isn't amazing, either. I think it would have been so much stronger if the characters had been more individualistic from the start.